Here’s a small batch of Fightin’ Uruk-Hai from Isengard. I picked them up off ebay recently (they arrived yesterday), so I have only these. I’d like to pick up some more. I like the figures and they paint up QUICK! The two new stands are the ones in the front; Blades on the left (of the picture), Spears on the right. Once again, these are Lord of the Rings figures from Games Workshop. That’s half of an army for Hordes of the Things right there. 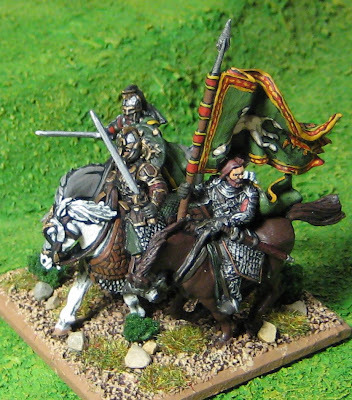 I have one warg rider and another in the mail (metal ones) and I’d like to pick up a box of the plastic ones which would give me 4x Beasts (assuming only 2 will fit on a base…). At some point I’d like to pick up a box or two of Fighting Uruk-Hai to give myself some more options for foot. I also have a spare Saruman and Grima Wormtongue figures to make a Magician stand (If I ever wanted Saruman to come down from Orthanc and fight with his mob in the field…). 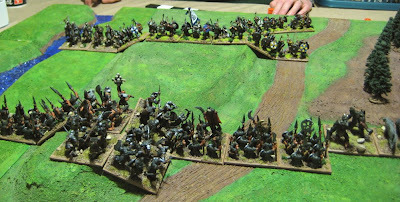 I worked on a pile of Orcs for my Middle Earth Hordes of the Things Armies over the weekend. They are all Lord of the Rings figures from Games Workshop. The metal ones (if you can pick them out) I picked up off ebay over the last couple weeks, and the plastic ones I picked up Saturday afternoon from a local fellow blowing out his LOTR stuff (thanks Paz!). These are Mordor Orcs. 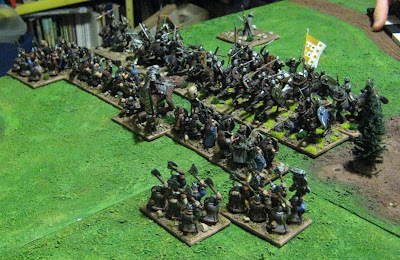 They’ll be another Warband – and sometimes a Warband General, at least until I have something better (or “worse”, depending on your point of view) to lead the armies of Mordor. 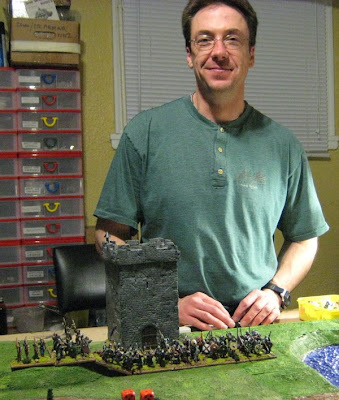 I have enough to make another four stands of warband and that should probably be enough… I also have a Mordor Troll and then I’d like to add something else… Hmmmmm… maybe an Aerial (anti-)Hero (the Witch-king on fell beast – if I can find one for a not-so-insane price)? …two stands of… uh… Blades…? Warbands…? I’m definitely going to call the “Fighting Uruk-Hai” sword and shield guys “Blades”. 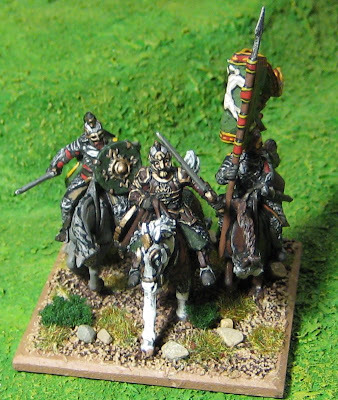 Maybe these guys will be Warband…? 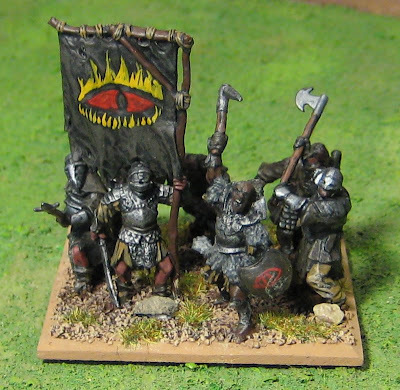 They are supposed to be “Scouts” – well that’s what the figures are called… and they look different enough from the Fighting Uruk-Hai (the latter being more heavily armoured). I was back and forth for a couple of hours in utter torment trying to decide how to base them! In the end I went with the big base as I like the LOOK of Hordes... even though these were going to be blades or warband… even though there’s only 6 guys on each of these bases… (I wanted to put on seven, but just didn’t have the figures – and I wasn’t about to run out and buy a pack of metal ones, or wait around for some to show up cheap-like on ebay, just to pack ‘em on a little more tightly...). 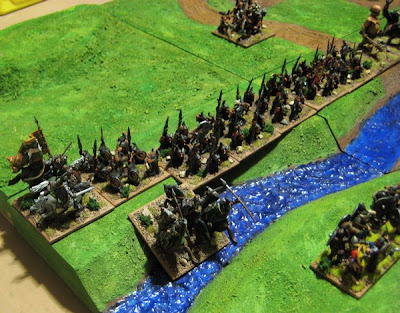 What about the blades though… probably the smaller bases… Ugh… I think about this too much…. 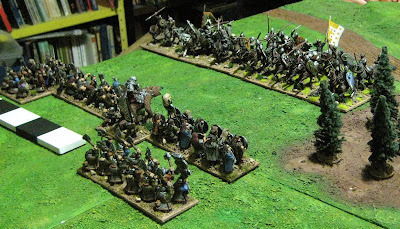 Alright… I got that out of my system… now to finish the Normans – Two more stands of infantry (Spears), then four more mounted (2x Knights, 1x Cavalry, 1x Light Horse) and to finish off the lot a stand or two of Crossbowmen…. 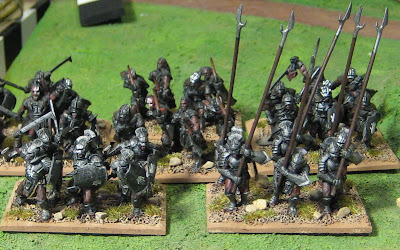 …or maybe I’ll just quickly paint up these two stands of Fighting Uruk Hai…?! The beginnings of some Norman Infantry for CVT. Two stands of Psiloi and a stand of spear (if you’re familiar with DBA and not so familiar with this blog… well… you’ll notice we do things a little different around here…). The Spear are from Gripping Beast. 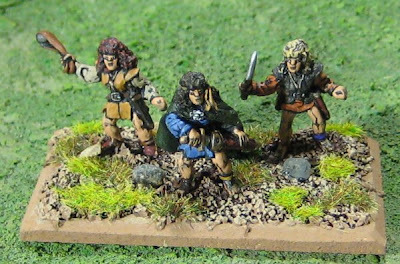 Another stand of Warrior Womyn (or not-so-Warrior Womyn, in this case) for Amanda’s Saphistic League of Unity and Togetherness and some “horse-men” of a different sort. These are Reaper Miniatures “classics”. Three Female Halfling Rogues (or something like that..) to be used here as “Sneakers”. WE haven’t used them yet (Sneakers that is) in a game. I was explaining to Amanda how they work and she thought the idea was pretty cool and is pretty stoked to use them. She’ll have to wait for a week, though, because she just left for a week in San Diego…. 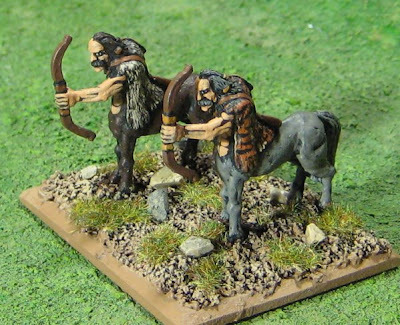 These are some Centaurs from Mega Miniatures. I’m really quite pleased with these. I picked them up because they were very reasonably priced and there just isn’t that many Centaurs out there (I’ve always dreamed of having an army of Centaurs!). I don’t think the pictures on Mega Minis site really does them justice. I was quite pleasantly surprised when they arrived. I imagined they would have been smallish and without a lot of detail – I was wrong on both accounts! I bought one pack of 8 – this will be a stand of riders, the rest (which are more heavily armoured and have hand weapons) are going on stands of three and I’ll call them Knights. 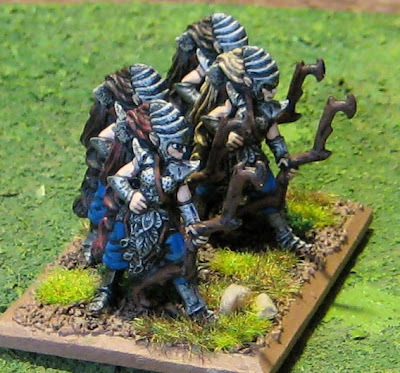 It’ll probably be a while before I realize the dream of an entire army of centaurs… but these will be a cool allied contingent for many I’m sure and provide a mounted contingent for my Narnians…. So far she’d be able to use my HOTT Dwarf Chicks of which there are three stands – all “Blades” (the rest of them can be seen HERE). I suppose there’s also the Dryads she could use as Lurkers. And she has a couple of options for wizards (both Elf and Human varieties – though I’d have to make new bases for both). I’d like to add some Shadowforge stuff at some point – especially some of the Dark Temple Centaurs!! Due to an unfortunate combination of bad spelling, atrocious grammer, poorly chosen words and even worse translation the Dwarf King Krizden thought King Darrin of Dondunald had referred to his daughter Princess Maeve as being “fat”. Truly there was never a skinnier Dwarf that ever lived. King Krizden immediately demanded an apology. 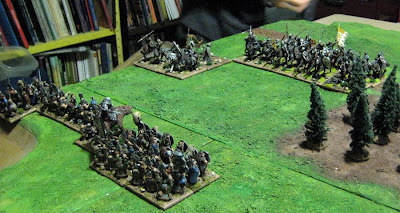 King Darrin not sure what he was supposed to apologize about refused and the Dwarves marched down from the hills to defend the honour of their young princess! 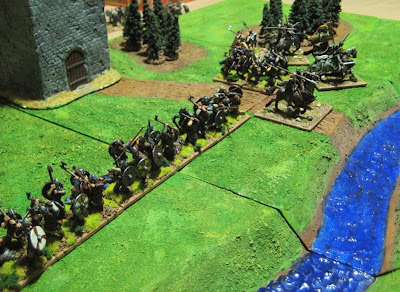 The Dwarves brought with them the wildmen of the north and, as luck would have it, King Darrin’s Brother-in-law Duke Huntingdon just happen to be in town… with his entire mounted field army…?! 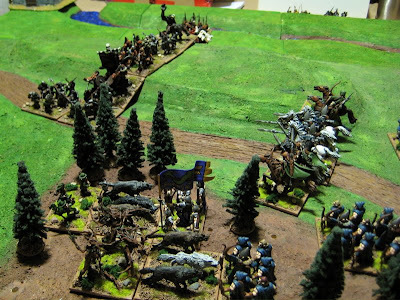 The Battle took place around Woozle Wood. Jarl Timbur – humans, etc. 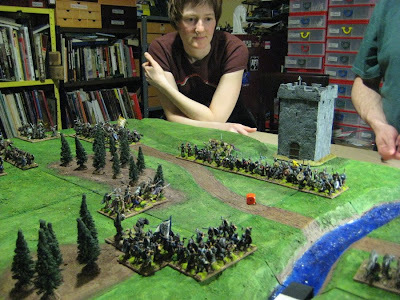 Lady Huntingdon (Amanda) and her army of Horsies (girls like horsies…). She's having a good laugh because just as I was about to take the picture she unzipped her jacket and someone said "Alright! going to show us a little cleavage!"... What? It wasn't ME?!! King Darrin (Darrin) and shi army of sturdy foot. King Krizden (Christian) and his Dwafish army. 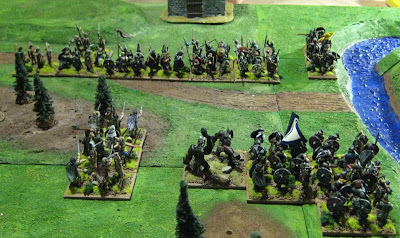 Jarl Timbur (some funny-looking, smelly, half-wit that wandered in off the street…) and his Viking-ish army. 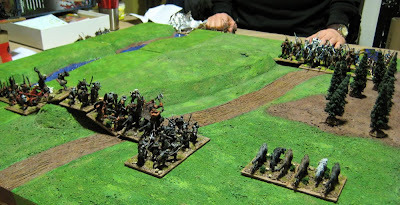 Duke (or Lady) Huntingdons Horse charge down off the hill to meet the Dwarvish invaders! HUZZAH!! The Beautiful and charming Lady Huntingdon surveying the battlefield. 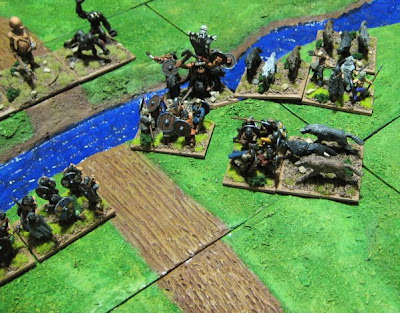 Wolves making their charge around the flank hoping to harass their rear or og for the stronghold. 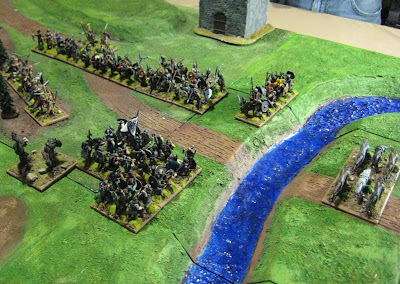 …and broke upon the sturdy Dwarven shield wall as water on a wall of stone! Back and forth they went for some turns. The horse slowly being whittled away. 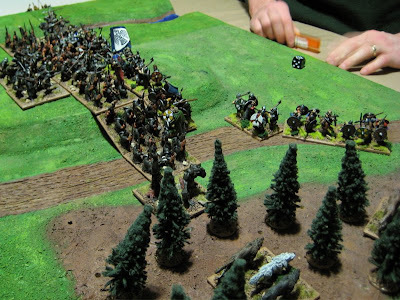 The main force of Jarl Timbur makes contact with King Darrin’s line. It is an inconclusive shoving match. 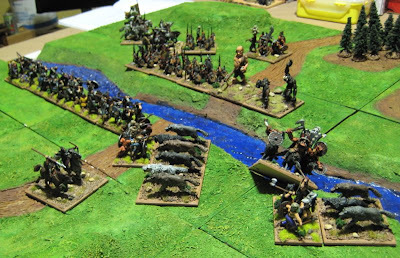 The wolves try to make their crossing a little further down river where they won’t be menaced by the Spear dispatched to deal with them. 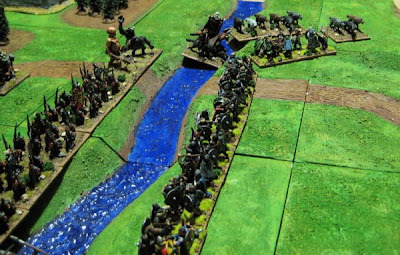 So King Darrin was obliged to appologise and peace returned to the two kingdoms – Though Duke Huntingdon was some peeved at the King for simply giving up the field with minimal loss to his own army after Huntingdon’s force was sacrificed. 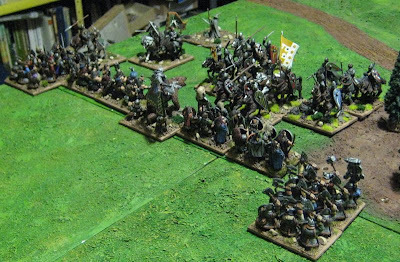 Here are a few more Knights for Chris’ Norman Army… I know… they have surcoats… He bought them. They were probably “crusaders” and he thought they were “close enough”. I pointed out that Normans are usually depicted as not wearing surcoats. He pointed out that really we have very little idea when Normans actually wore and maybe they DID wear surcoats and I said fair enough! Who am I to argue with that? I’m no historian!? If you think it’s “wrong” tell Chris about it - and tell him to his face so he can poke you in the eye with a pointy stick! 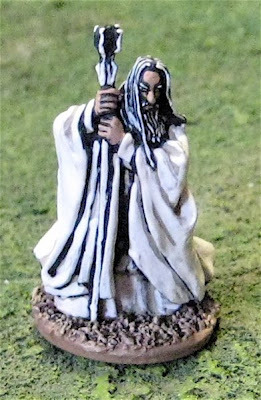 Saruman – another Lord of the Rings figures from Games Workshop. 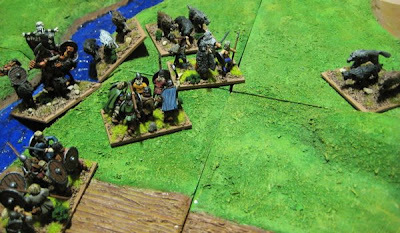 On Thursday evening the Orcish hordes of Timmillur the Clean descended on border post near of the Fords of Robaart on the Rumbeer river – the border between Civilized Lands and the Dark Wilderness…. Waiting for them was the Army of King Timm II (also known as Timm the Brown – or Timm the Unclean…). Uh… who rolled that one…? 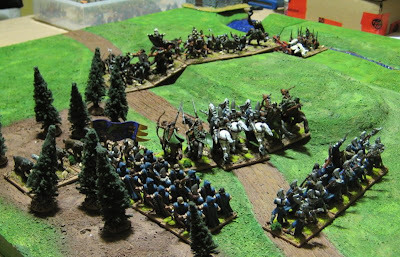 The Heroic King Timm II rashly charges in to head off the beasts making for the rear…. 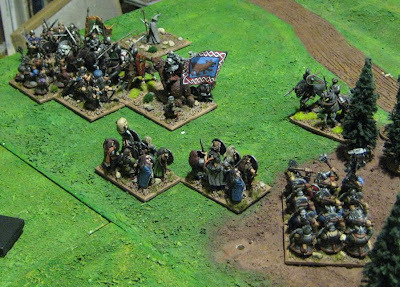 His Knights following a bit too close behind. 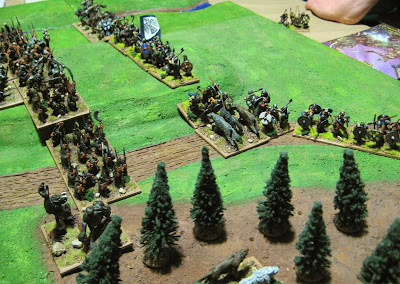 The ferociousness of the wolves took King Timm a bit off guard and forced them to recoil into the knights which caused chaos and confusion – rumours quicly spread that the King had been killed and the army abandoned the field in panic and disorder! 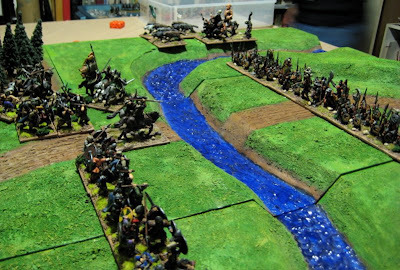 The forces remained the same as the orc army poured across the northern ford onto the Isle of Robaart (an Island caused by a split in the river). The army of Timmillur the Clean holding the border fortress on the Isle of Robaart. 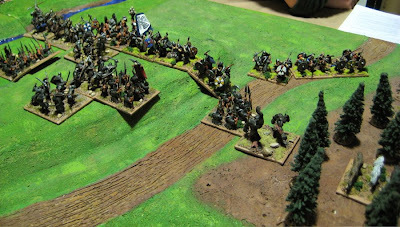 King Timm and his knights try to force their way across and toll up the flank of Goblin Horde! Timmillur and the beasts attack the east end of King Timm’s line. 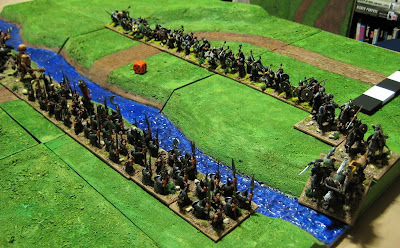 The Berseks and Blades at that end of the line did sterling service holding off relentless attacks by the ferocious wolves – against all odds…! Time and again the wolves attacked and were repulsed! 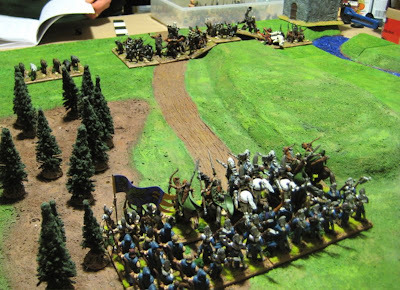 They will likely regroup in the wilderness and return… but King Timm II will be ready for them! 1x Horde? I might have knocked out one or two… maybe three… I know at least one was returned to the tabletop… Whatever.. they’re hordes they don’t really even count. These are Lord of the Rings figures from Games Workshop. 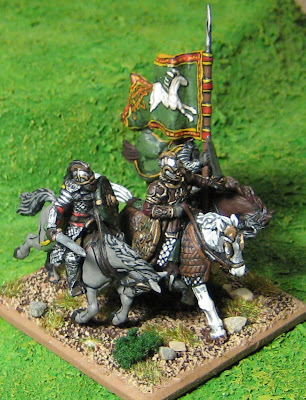 King Theoden is in the Center there flanked by Gamiling/Royal Standard Bearer and a Mounted Royal Guardsman. 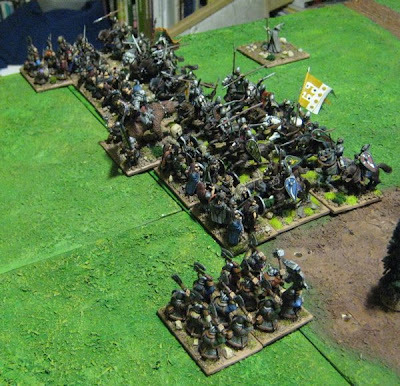 Here he is commanding the rest of the Rohirrim thus far mustered – a stand of riders and another stand of Knights. I am going to have one more stand of Knights, the rest will be riders. 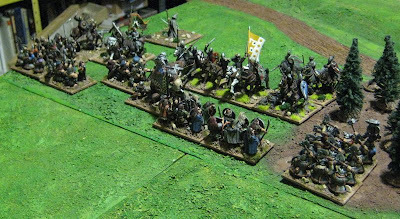 One of the stands of knights I might occasionally field as a “Hero”. 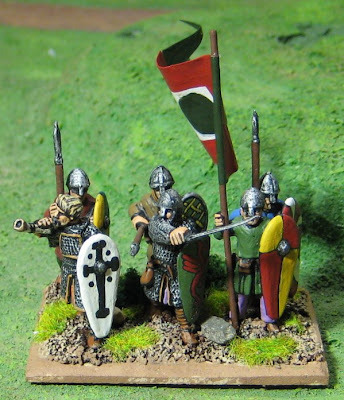 Eventually I’ll pick up some Warriors of Rohan and have some foot options – blades, spears shooters, etc. Usually my friend Mr. Miller stops by one evening a week to hang out and paint toys. 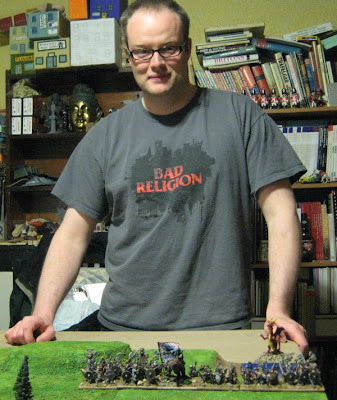 I’ve got him interested in Hordes of the Things now though, and as the games are quick we can get in a quick game AND still do some painting. Mr. Knudsen also had a free evening so he joined us for a game as well! 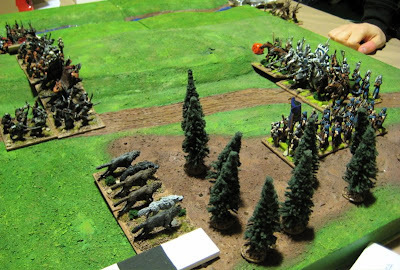 Then the reserve moved up and that was the end of that pack of wolves. 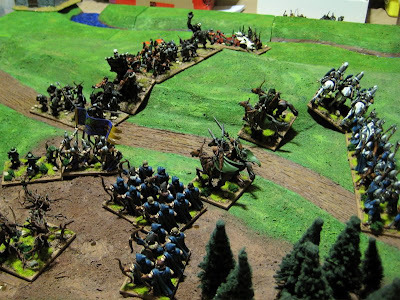 The Generals warband punched a hole through the Viking lines! The goblin hordes vapourized!? GAH!! 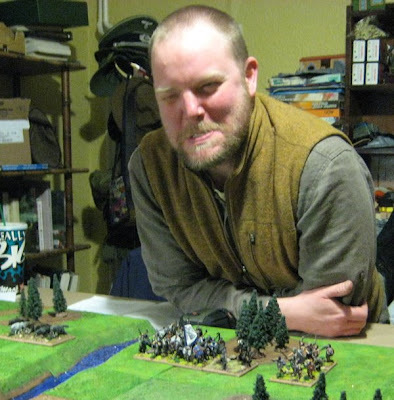 Mr. Knudsen making so clever tactical maneuver that likely spelled my DOOM! DOOM! I tell you!! 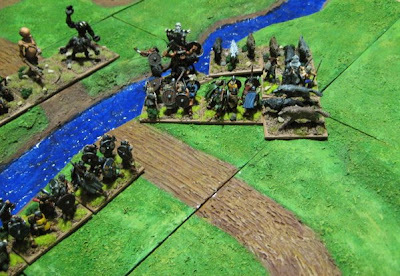 … and destroyed… The rest of the gobliny-orcish army fled back into the wilderness in panic and disarray! Jarl Knudsen orc-slayer was made a hero in many Vikingish songs and epics. 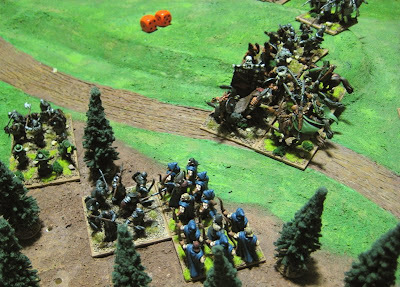 The forces deployed… What is with those elves…? They got somethgn tricky up their sleeve…? Hmmmmmm…. maybe they're "hiding" behind the woods and going to launch a sneak attack...? 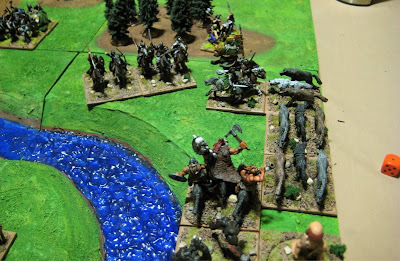 Once again wolves head for the woods, but things turn out a little differently here. 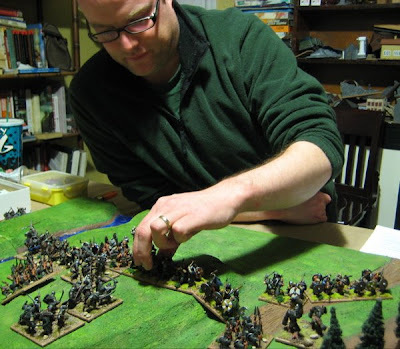 With his single pip Mr. Miller marched the column of Elf archers into the woods – I was beginning to wonder if the elvish commanders name was Braddockadyll..? GRAAAARRR! 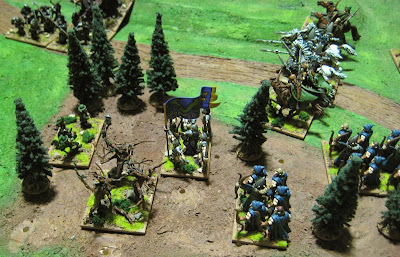 The wolves descend upon the elves in the woods. The elves send then scurrying away with their tails between their legs. Hmmm that seems to be it for pics. 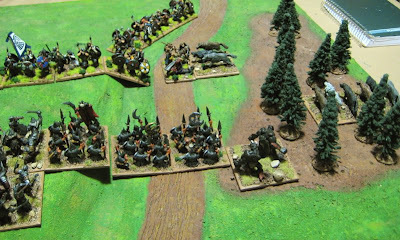 I think what ended the game was the elvish hero pulling out of line and wheeling around on his own to flank the trolls and wipe them out . Then we put all the toys away and did some painting. I worked on Gamling – the army standard-bearer for my HOTT Rohirim and some other figures sitting at the front edge of the workbench. Mr. Miller painted some Space Marines. Christian just hung out for a bit and read some rules and yapped with us. These gaming-painting combo nights are really working out for me… We should do this more often!